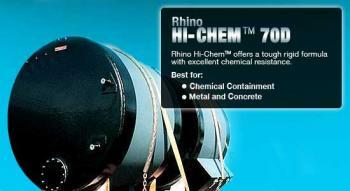 Hi-Chem™ is Rhino Linings’ most chemical resistant formulation, remaining stable in a variety of immersion applications. It is typically sprayed onto metal and concrete surfaces, but it can adhere to almost any substrate. Hi-Chem provides excellent corrosion resistance and will not deteriorate from most chemical attacks.Hi-Chem has a Shore D 70 (ASTM D2240) hardness and a 25-30% (ASTM D412) elongation formulation, which gives it some flexibility and it is our most rigid formulation with the highest amount of molecular cross-linking in its formulation. It has excellent stability for immersion applications and chemical resistance. Hi-Chem can be applied with either low or high-pressure equipment.